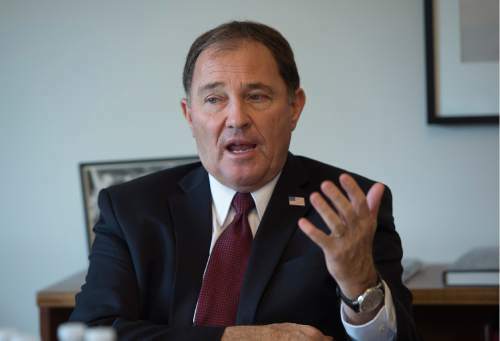 Poll • Herbert has a 2-1 approval margin; only 39% approve of the job lawmakers are doing, citing the controversial state prison move and Medicaid expansion fiasco as examples. 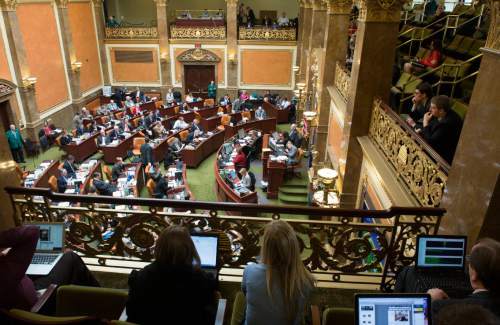 Governor and Legislature poll results Rick Egan | Tribune file photo A view of the Utah House of Representatives from the gallery during a recent legislative session. 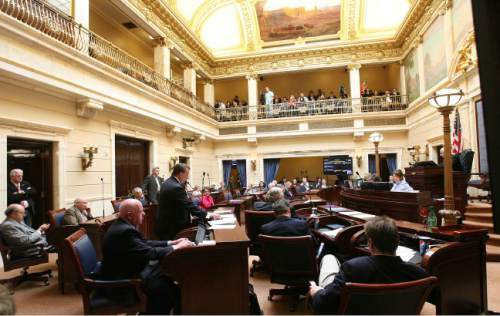 Leah Hogsten | Tribune file photo The Senate chamber during a recent session of the Utah Legislature. 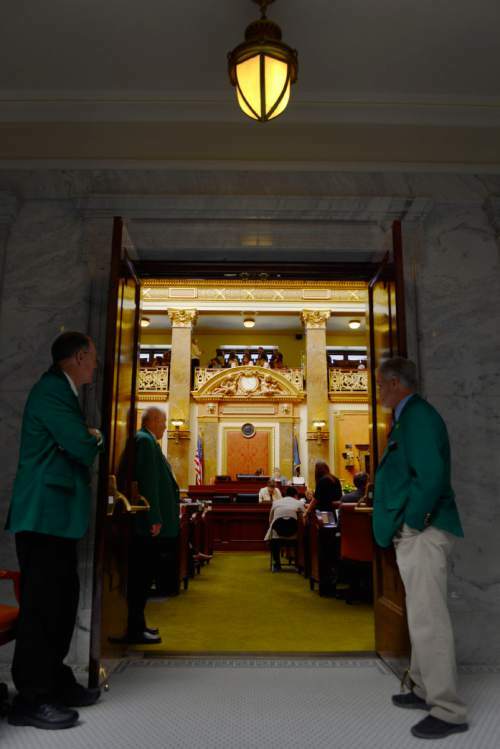 Steve Griffin | Tribune file photo A view into the Utah House of Representatives from the Capitol Rotunda's front entrance to the chamber during a recent legislative session. Scott Sommerdorf | Tribune file photo Gary Herbert • Utah governor Scott Sommerdorf | Tribune file photo Utah Gov. Gary Herbert told lobbyists he will meet with their clients anytime, anywhere in exchange for generous donations to his campaign. 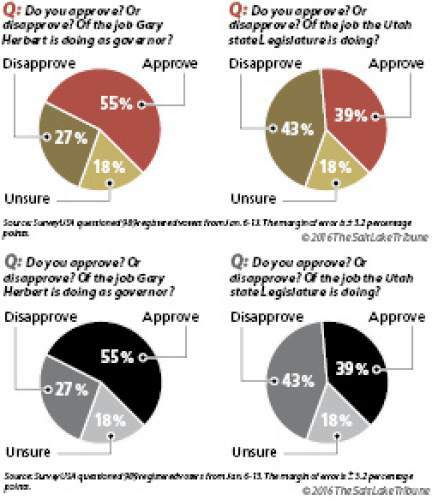 A new poll shows that Utahns approve of Gov. Gary Herbert&apos;s job performance by a 2-1 margin. But they don&apos;t care much for the Legislature. A plurality of Utahns actually give it failing marks. That&apos;s according to a statewide poll by the The Salt Lake Tribune and the Hinckley Institute of Politics, conducted by SurveyUSA. It shows that 55 percent approve of Herbert&apos;s performance, while 27 percent disapprove and 18 percent were unsure. But for the Legislature, only 39 percent approved of its work while 43 percent disapproved and 18 percent were not sure. 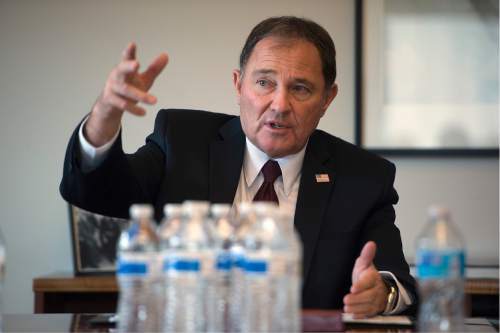 "Governor Herbert has great appeal and his numbers have remained strong for some time," said Jason Perry, director of the Hinckley Institute of Politics at the University of Utah and a former Herbert chief of staff. "The economic-development message that he is able to present is very well received. People perceive that he is implementing policies and procedures and marketing the state in such a way that our economy is stronger than most," he said. "The Legislature has provided the tools for those sorts of economic opportunities, but often times those great policies are sort of obscured by the sorts of debates they have to give on other items. Expanding Medicaid [blocked by the House amid bitter fights] certainly is a big one," Perry said. Senate President Wayne Niederhauser, R-Sandy, agrees. Everybody&apos;s offended • "The governor is a committee of one and has a little bit more control over the messages and issues he deals with," Niederhauser said. "But there are 29 members of the Senate and 75 in the House … and any issue that a sponsor embraces can be brought before the Legislature, and we have to deal with it." He adds, "By the time we get through all our issues, we&apos;ve offended everybody on something." Niederhauser said issues that have raised the ire of large groups in the past year include the impasse on Medicaid expansion, a decision to move the state prison, ongoing debates about medical marijuana and raising the gasoline tax. Lee Garner of West Point in Davis County was among poll participants who liked the work of the governor, but not the Legislature. "The governor seems to have a good grasp on what the state needs on education and jobs," he said. "The Legislature has been stingy with education money. ... It doesn&apos;t like anything that doesn&apos;t take care of its own interests. … They follow their own opinion, and not the opinion of the people they represent." Kathie Coopersmith of South Ogden, another poll participant, said that even though she is a Democrat, she still approved of Herbert&apos;s performance "but it was a close call. He&apos;s done some things I&apos;ve liked, and some I haven&apos;t."
It was not close, Coopersmith said, when it came to the Legislature. "I don&apos;t think the Legislature represents what the people want. They moved the prison, but most people wanted it left where it was. They refused to do anything with Medicaid, but most people wanted it expanded." Party affiliation matters in the job ratings. Republicans approved of Herbert&apos;s performance by a wide 71-11 margin. 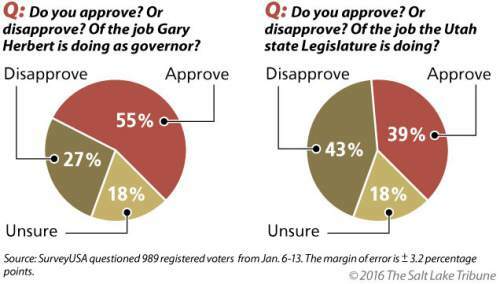 The governor&apos;s approval margin among Democrats was 34-49 and independents, 48-33. A slight majority of Republicans likes the job the GOP-dominated Legislature is doing, but Democrats and independents do not. The approval rating margins are: Republicans, 52-26; Democrats, 24-62; and independents, 38-46. Teamwork • Herbert is happy with his approval ratings. "The governor appreciates the support of Utahns from across the state," said his spokesman, Jon Cox. Cox also offered some balm to the legislators who trail the governor in such ratings  and managed to take a swipe at the same time at President Barack Obama. "Many of the successes our state enjoys today would not be possible without a supportive Legislature. Unlike others in the country, Governor Herbert doesn&apos;t believe in governing by executive order. It takes teamwork to find lasting solutions," Cox said. Herbert&apos;s ratings in the new poll are down a bit from some other recent similar surveys. For example, Morning Consult  a Washington, D.C.-based political consulting firm reported in November that Herbert had a 61 percent approval rating, while 26 percent disapproved. Morning Consult did similar polls on governors in all 50 states, and found that Herbert had the 11th highest level of support among his colleagues going into this election year. Meanwhile, Niederhauser found some minor solace in that approval ratings for Congress nationally are even lower than for the Legislature  in the teens compared to the 39 percent for the Legislature. He notes Congress has even more members  hundreds more  who can bring up more issues, or block them. "They go way beyond where we are, and are in a state of nonaction because they can&apos;t agree on the smallest of issues," he said.